The Putnam Development Authority offers a pro-business, cost effective environment for business and industry success. 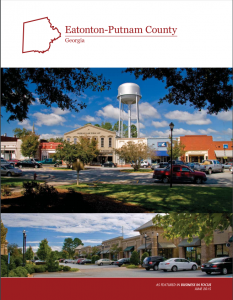 Created by law out of the Georgia State Constitution, the Putnam Development Authority is a Constitutional Authority focused solely on serving the needs of new and existing businesses in Eatonton and Putnam County, Georgia. The Putnam Development Authority acts as a liaison between legislators, key business sector associations and companies developing incentives and policies to strengthen Putnam County’s business environment. This, coupled with our work uniting local and state government entities to create Performance-Based Incentive Packages, offers a competitive environment in which our businesses can thrive. If you’ve decided to bring your company to our area, we’ll be there to work with you through the entire process helping you access the information and resources you need. If you’re already doing business here, bring us your challenges, and we’ll identify resources and programs that can enhance your opportunities for success.